Set within an astounding property this kitchen was to form the major feature within the east wing of the house. 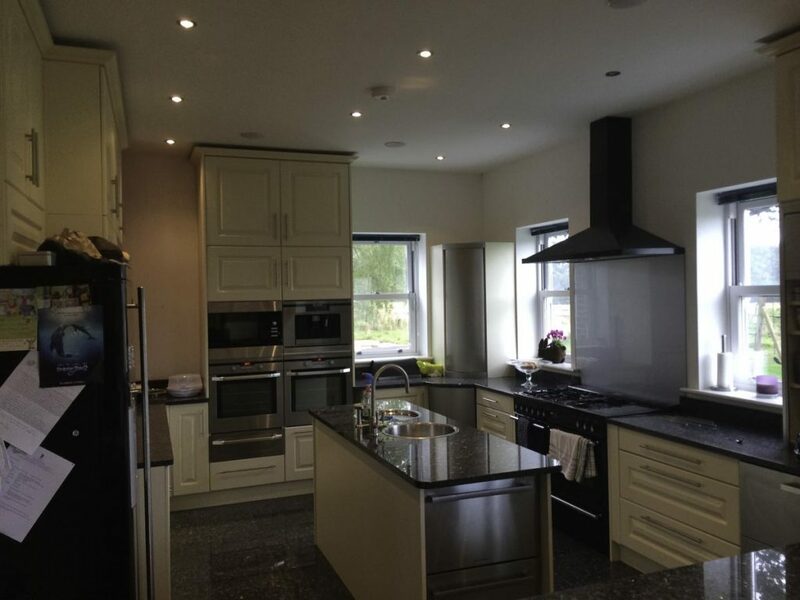 Our clients were very simply looking for the best available and wanted a kitchen that would live up to the rest of the house. In terms of practicalities the kitchen had to deliver all the very latest integrated Siemens appliances, including Full height integrated freezer with ice and water, full height fridge, combi Steam oven, combi microwave, full size oven, coffee machine warming drawer, free induction hob, down draught extractor, dishwasher, double sink, waste disposal, spray tap, filter tap, boiling water tap, oh and a dishwasher! The style was to be contemporary and elegant with a wow factor that would last for years to come. 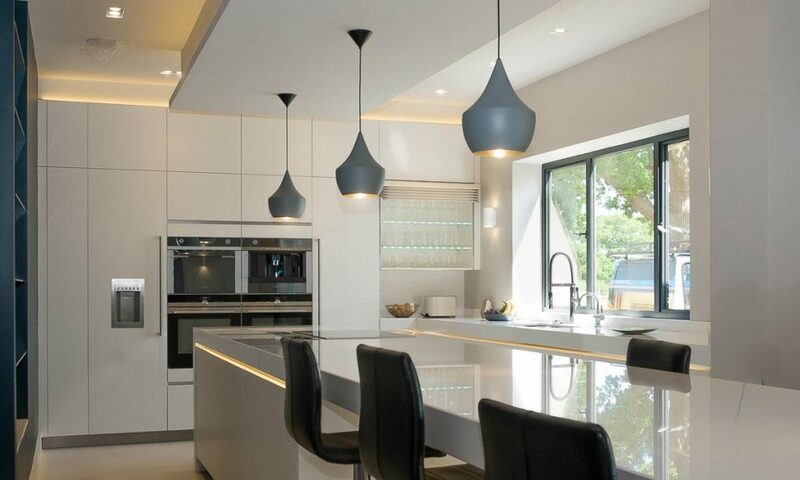 The layout was established fairly early on with the kitchen focusing on two main features, a 6 meter long island centred on a floor to ceiling bank of storage and appliances. 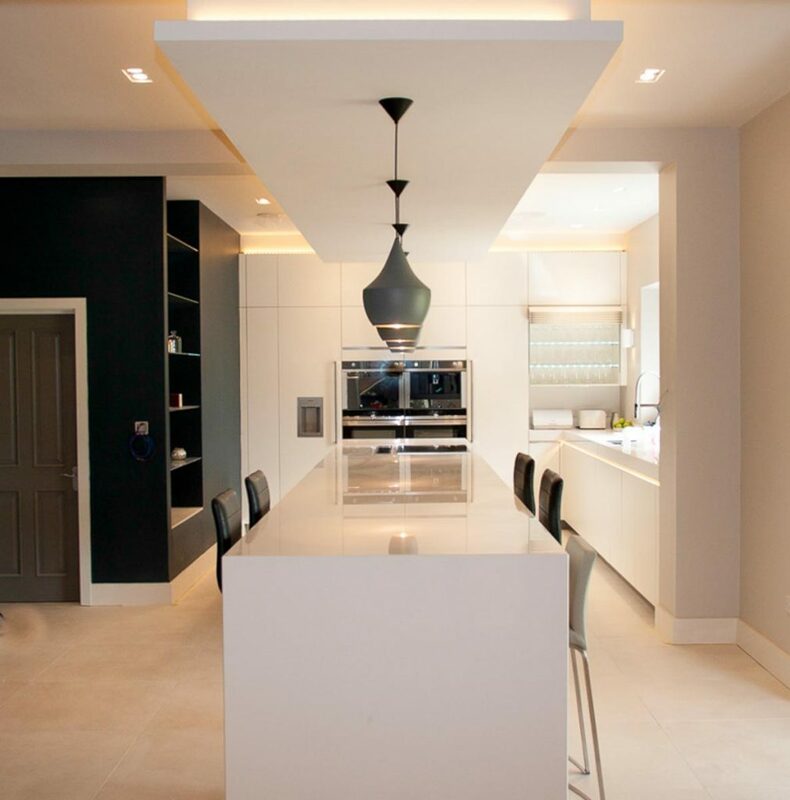 The effect of this perfect alignment was to be further enhanced by the dramatic drop ceiling that would run above the island, incorporating feature lighting and hidden ventilation. The key with a large room is to develop a scheme to maximise both the visual appeal and the functionality of the space. It can be very easy to lose the efficiency of the “working” part of the kitchen. To avoid this we centred the action on the far end of the space. 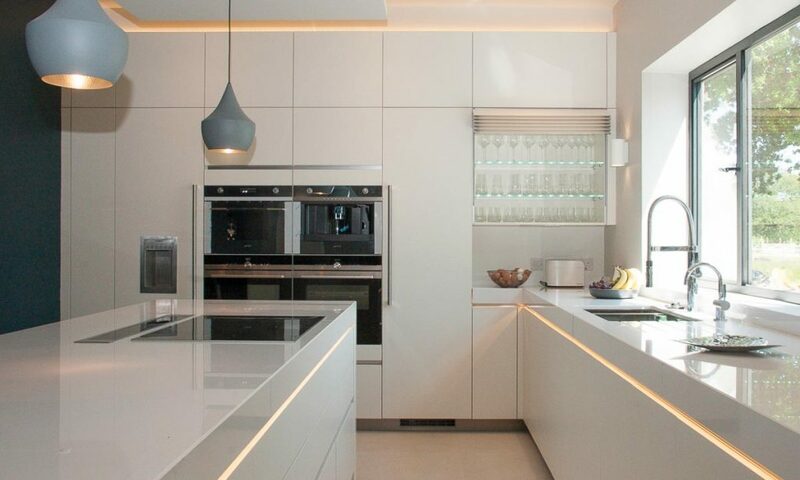 Sink, hob, ovens and fridge are all very close to one another making it a kitchen that not only looks great but one you can actually cook in too. The next part of the challenge comes in designing the space around the kitchen. 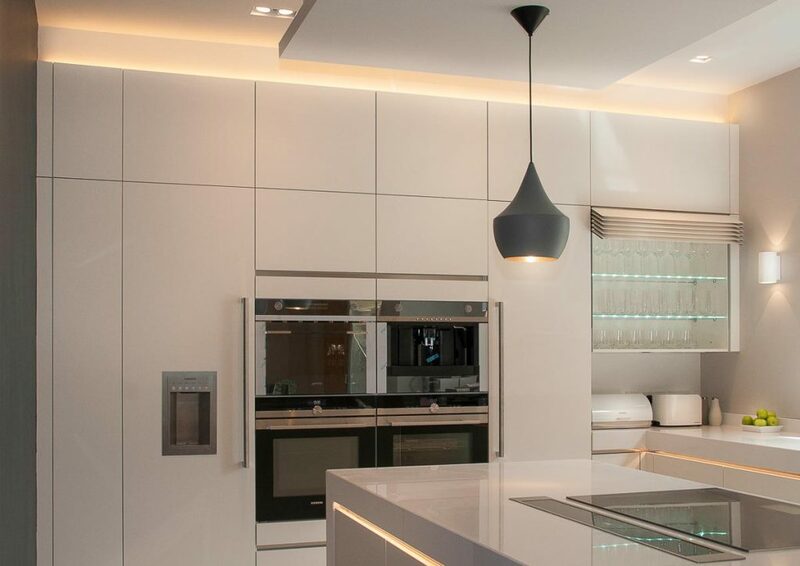 In this instance it is the perfect alignment of the oven bank, island, the drop ceiling and the feature lights combine together to create the effect of a dramatic, perfectly configured space. 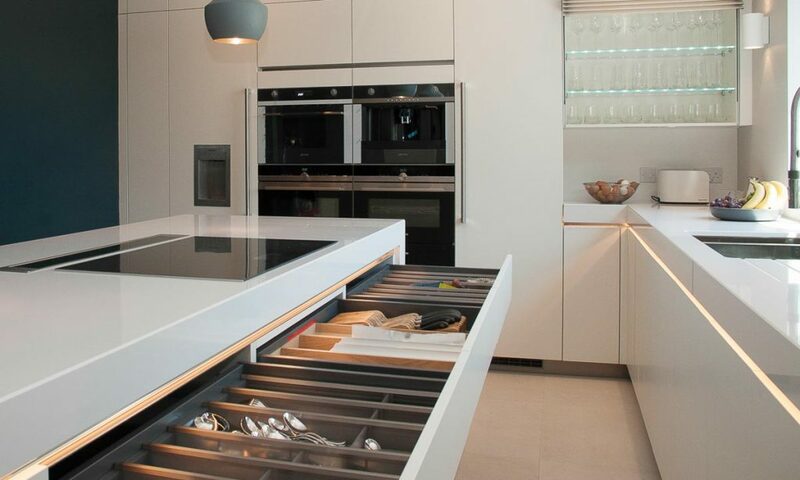 The main feature island consisted of a 3 meter run of drawers at one end and then a dramatic, 3 meter long breakfast bar at the other. To cope with such a span we designed a custom made steel support that sits within the 100mm quartz. The result is stunning simplicity, beneath the surface it is anything but! 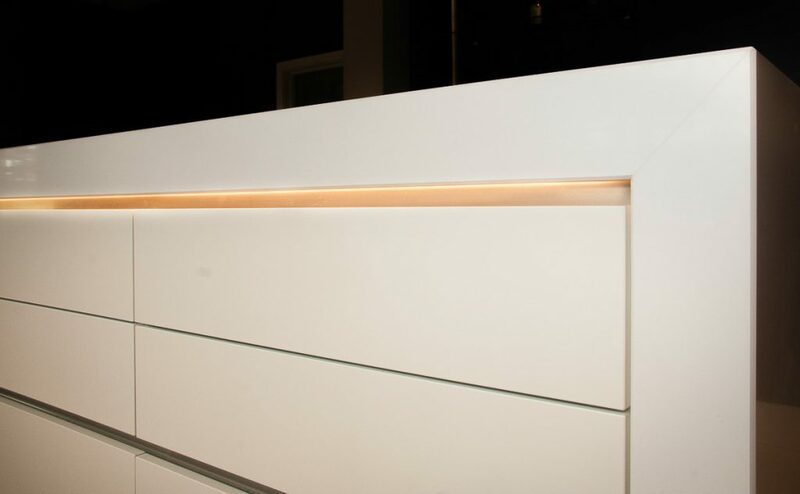 The choice of Satin white handle-less cabinetry with integrated LED lighting gave us the chance to add 100mm Diamond White worktops to create a look of timeless contemporary, elegance. 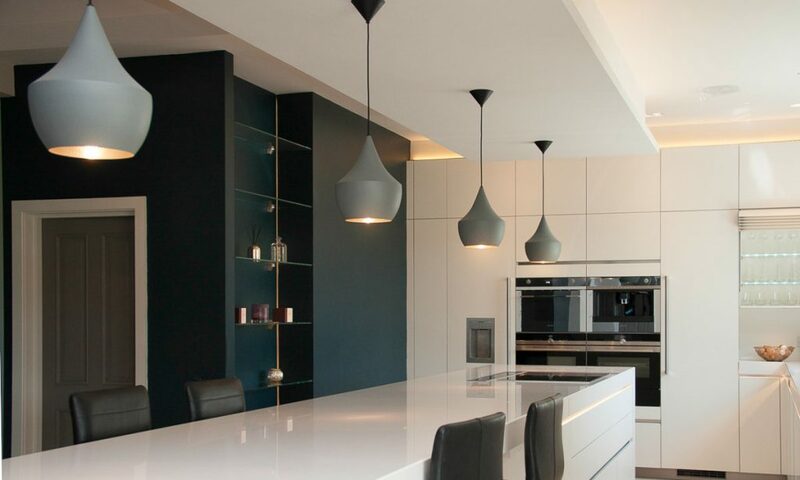 The pure simplicity across the finishes allows the lighting to really elevate the design in the subtlest of ways. On a project such as this it is a huge triumph when it comes together so successfully. The apparent simplicity of the design hides a world of hidden complexity and intricate design detail. Achieving such precision over a large scale, having the ability to communicate the detail, not mention the exactness, of the structural requirements is absolutely key to the finished result. Before the space even exists every detail must be decided and then the space is reverse engineered to allow for the finished kitchen to fit so perfectly within it. There is no room from error, the floor tiling covers over 300m2 in this particular living/ kitchen space and is all aligned to the centre of the island. 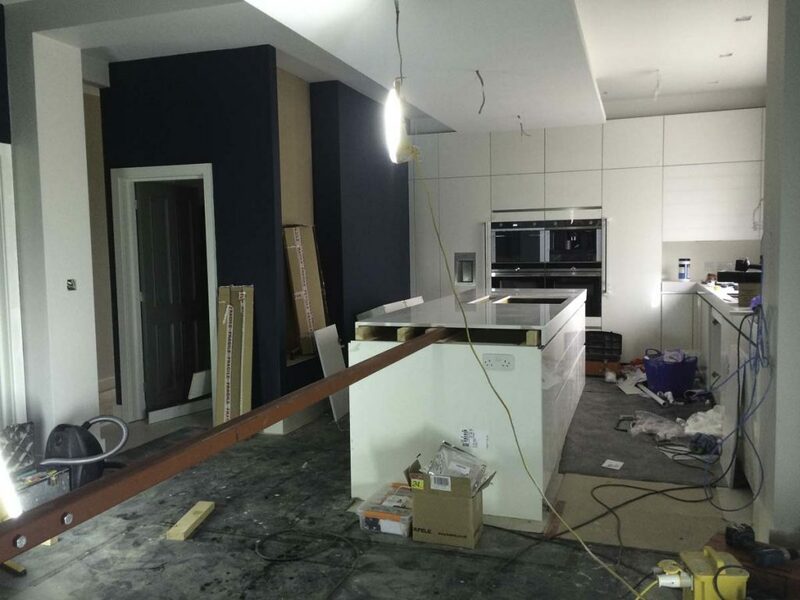 So long before the space is anywhere near complete we had to give a centre mark for the grout joint, the drop ceiling, the island and the vast bank of tall units. Get this wrong and you have a very expensive, very complicated headache on your hands. No pressure! 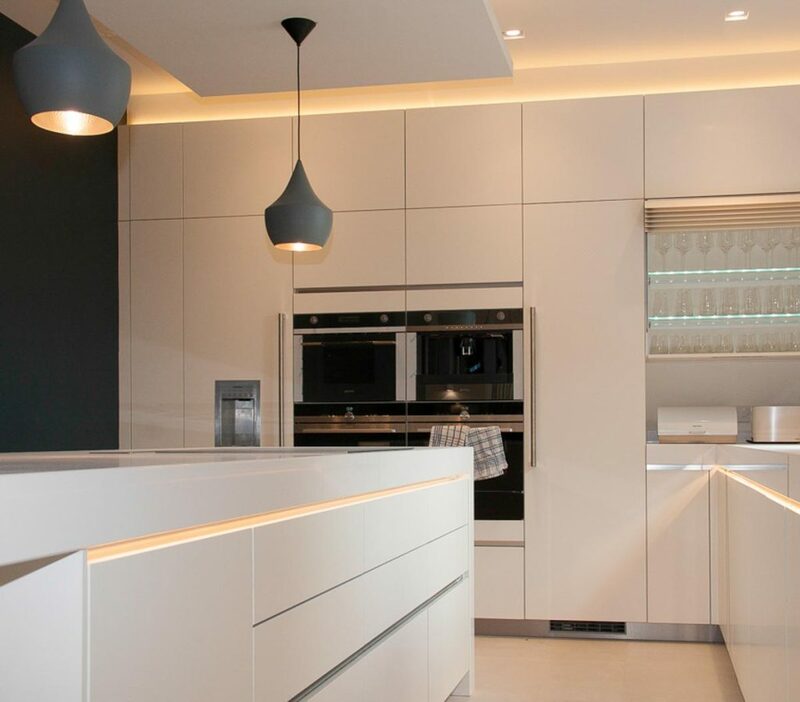 That we have developed the skills to deliver on these types of project is a wonderful testament to us as designers, project managers and installers. The work by Zac and Jake to deliver such quality in the installation phase is something we almost take for granted now, they deserve a special mention here though, the quality is simply first rate. Francis Tate Marble Works, our long standing quartz and granite partners, also deserve a special mention. Their work on the quartz worktops is so good Samsung, the quartz manufacturers, want to use this kitchen for their own marketing and website.